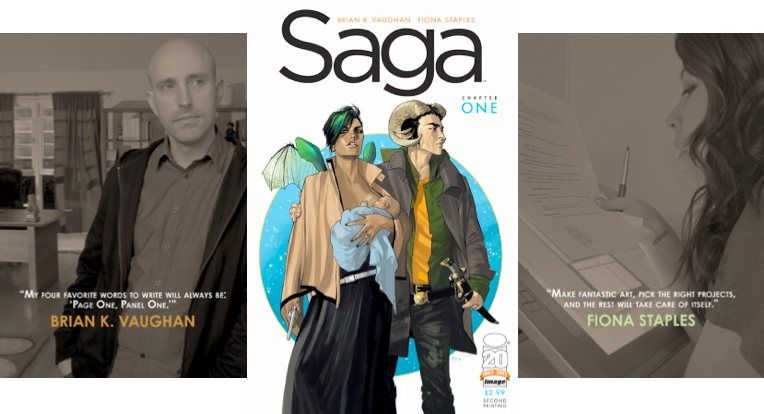 I had the pleasure of sitting down with Brian K. Vaughan and Fiona Staples to chat about their new ongoing Image Comics series Saga. It was both surreal and a lot of fun. I have to thank Jennifer De Guzman – PR & Marketing Director of Image Comics for hooking me up with the opportunity. For all who don’t know, Brian K. Vaughan is my main inspiration for starting to write comics in the first place. I was fortunate enough to hang out with Fiona over the convention weekend too. I’ve been a huge fan of hers for years so it was great to see that she was friendly, charming, and a lot of fun to get to know. I was instructed to head to the Kaiser room on the fourth floor of the hotel on the last day of the con. This was where the interviews were taking place. I go up and find that no one is there and the room is locked. A bit perplexed, I just kinda stood in the hallway for a moment. I suddenly heard a voice from down the hall ask, “Hi, are you here for the interview?” I look over and it’s BKV walking towards me. Not gonna lie, my heart stopped. He was polite and super friendly. We chatted on the way to the elevator and decided to conduct the interview at the hotel bar. In the lobby, Fiona was waiting for us to which she said to me, “Oh, it’s you! You’re our last interviewer?” Brian looked at us and asked, “You know each other?” I was a bit beyond words realizing the moment I had found myself in. My inner geek was about to faint. Needless to say, the interview went smoothly and was a lot of fun.